(Dates are incorrect) Have you seen this van? 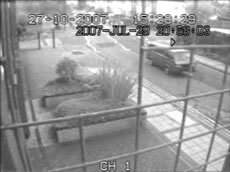 Police are releasing a CCTV image of a van that they would like to trace in connection with a fail-to-stop traffic collision in Acton. Between 4.00pm and 5.00pm on Saturday October 27th a collision involving a girl and a van occurred on a pedestrian crossing at North Acton Road, at the junction with Wesley Ave, NW10. The dark coloured van failed to stop at the scene. Rachel Popoola aged 5 who lives close to the accident scene in Acton, was taken to hospital suffering multiple injuries. She currently remains in hospital receiving treatment where she continues to recover. Rachel was walking with her older brother, her sister and cousins when hit by the van. Her brother reportedly spotted the van speeding towards the crossing and managed to pull the other children to safety. Rachel was taken to the Central Middlesex hospital suffering multiple injuries and then later on to Great Ormond St. The van is believed to be a Volkswagen Caravelle or Transporter and it is likely that the van will have sustained damage to the front of the vehicle and may have broken front lights. If anyone is aware of a van which sustained damage of this nature after that Saturday evening Police are asking them to get in touch. Anyone who witnessed the collision or can assist the enquiry should contact the Traffic Serious Casework Unit at 020 7230 4995; if you wish to remain anonymous please call Crimestoppers 0800 555 111. Residents living close-by made an impassioned plea to Councillors and residents at the Acton Area Committee last week. They say the area is an accident blackspot. An elderly resident, Rose Cleary, was killed nearby on November 17th, only three weeks after Rachel was injured. The situation could become worse after permission was recently granted for a bus depot to be sited which would worse traffic in the area.